As a customer of Albion Armorers and/or Film Swords LLC, you certify that you are under no restrictions of law that may prohibit or restrict your possession of edged weapons. 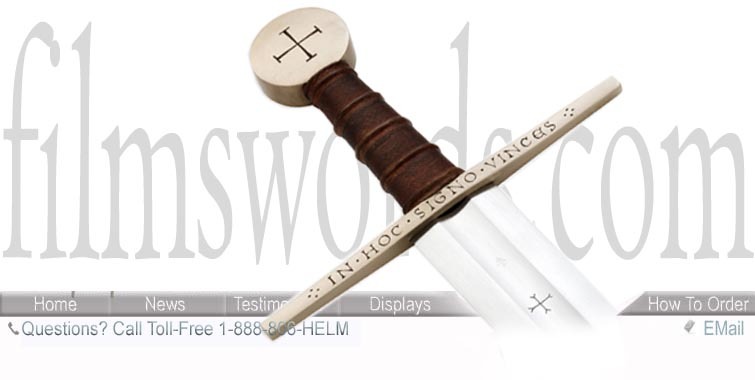 It is the responsibility of the buyer, not the seller, to ascertain, and obey, all applicable local, state, federal and international laws in regard to the possession, and use, of any item purchased from Albion Armorers/Film Swords. All equipment is sold subject to public law 90-351, title III, U.S.D., Section 2511, and any local, state or federal ordinances. Consult your local and state laws before ordering if you are in doubt. By placing an order, the buyer represents that the products ordered will be used in a lawful manner and that the he/she is of legal age. Albion Armorers/FilmSwords will not be held liable for the misuse of any product purchased from us or any of our distributors & dealers. You agree to indemnify and hold harmless either the company, its owners, investors, board members, and staff against any and all claims, demands, actions, or proceedings, resulting in injury, death or damages, losses, and/or liabilities, costs and expenses, including attorney fees, relating to or arising out of any claim asserted by you against the aforementioned companies. We require a deposit on all items ordered. We also offer easy payment plans. Deposits/payment plan deposits are non-refundable except as store credit. ** We will charge a $25 returned check fee if any check does not clear the bank. If you are unhappy with your purchase, return the item in its original condition within 30 days of receipt. We will initiate a refund check for the purchase price, minus a 15% redemption fee, which covers bank and merchant fees, and staffing for Customer Service, Accounting, Shipping and Inventory. If an item is defective in any way, please return it for repair or replacement. Please understand that we are a small business, and cash flow is obviously essential. We reserve the right to refuse refund of all or part of the purchase price if it appears the product returned was damaged by the customer while in his or her possession. We do not agree with most businesses these days, which all require that any refund is in store credit, and we do not wish to go that route. However, we do ask for patience in the return of your money. We will initiate your refund as quickly as possible, but please note that any refund exceeding $1,000 may take up to 60 days to process. Refunds under $1,000 may take up to 30 days. Deposits, executed payment plans and custom orders are non-refundable. Upon cancellation of an order, the funds will be issued to you as store credit. If you have any questions on our return policy, or anything else, please feel free to drop us an e-mail or give us a call at 1-888-806-HELM. We reserve the right to refuse refund of all or part of the purchase price if it appears the product returned was damaged by the customer while in his or her possession.